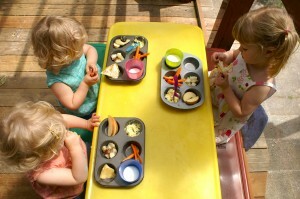 With three young kids who each have strong preferences about food, meal and snack time can sometimes stress me out! Trying to find something easy but healthy that all the kids will eat becomes a challenge; I want there to be at least a few foods each child likes, but I also don’t want to become a short-order cook, creating different meals to suit each kid’s current (ever-changing) tastes. It’s easy to latch on to the same (limited) rotation of things that I know they will eat, but boy does that get old – and boring! Enter: muffin tin meals! They are just so easy, and they lend themselves really well to toddler and preschooler eating habits: little bits of this and that, all separated, nothing touching. All you do is this: at mealtime, instead of a plate or bowls, grab a muffin tin. Fill each hole with a different thing – I do a carbohydrate or whole grain or two, a fruit and/or a veggie, some kind of protein, a dip or condiment, and maybe a treat or dessert. Add toothpicks or chopsticks for fun if you’d like. I find regular six cup tins work best for us, though they are becoming harder to find, I’ve found – most in stores now are 12! Mini-muffin tins can work as well, as can ice cube trays, at least for smaller items. I often find this is a great way to empty out the fridge of leftovers – and for some reason the novelty of the presentation makes my kids a lot more likely to give things a try! 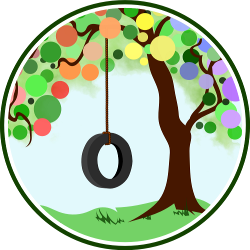 Sometimes I will put a new food in one or two of the cups, and I can easily cater to each child’s dietary needs or preferences by substituting one thing for another, if needed. Here is the Muffin Tin Meals Flikr group with many more pictures of all sorts of muffin tin meals. There are some folks out there who take this to the extreme – super fancy, time-consuming, themed meals for tots, and while they are impressive and sometimes fascinating, that is just not my style – we go pretty simple around our house! But, I find the concept is a really good one – my kids cannot wait to dive in when they see the muffin tins on the table! Do you do muffin tin meals, or something similar? What type of container do you use, and what are you and your kids favorite things to put in them? I am always looking for new ideas! 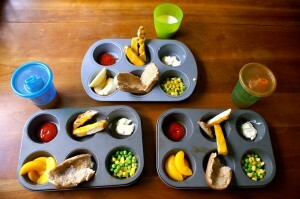 19 Responses to Making Lunchtime Fun: Muffin Tin Meals! That’s a wonderful idea. We have retreated to finger foods as the meal of choice for most dinners; I wonder whether this would help expand the overall number of options? How creative! I can see where something like this would be really appealing. My son is 14 months old…I think I could adapt this idea for him. We couldn’t do toothpicks but finger foods would be fun. Thanks, Jenn! It definitely works for young toddlers too! I’d put less food in them when they were younger (to avoid overwhelming and/or dumping). Dips like yogurt/hummus are also good, along with some “dippers” (though my girls end up using their fingers half the time, even now!). These are so neat! I’ve done muffin tin meals all of one time, but my daughter loved it. Thanks for inspiring me to try it again. Kristin, I always find your posts on NPN inspiring and this one is fabulous!!! Just what I need. My 2 and half year old is picky in the extreme and my 17 month old who has until now been the champion eater is just starting to get fussy. I will try this one out FOR SURE!!! Do you find though that they tend to go for the fruits first which then dampens their tastes for savory? My girl ate 3 apples in a row this morning and I could just see her emptying out that part of the tray and asking for refills while the rest was left! Thanks, Terri! They do always go for their favorites first (which is often the carbs and/or fruit), but I try not to refill any until they’ve had some of the other things, too. Some things I just refuse to refill, as well — it just depends on what it is and if we have more! My younger girls were AMAZING eaters for their first year or so, and around 16 months they started getting picker and picker, too. Nothing like their sister, though (knock on wood), thank goodness! I use muffin tins for grazing trays. I fill them with fruits/veggies/beans/nuts and let them have at it when they feel like it during the day. I love this idea! Especially with toothpicks and small bites, I could see the novelty maybe encouraging Mikko into trying out some new tastes. Great idea! My kids are always finding creative ways to play with our colorful & fun-shaped muffin pans. Now, I can give them something new. They love their bento boxes. This is a similar idea, but with a twist. I’ll bet they enjoy it tomorrow! I’ve been wanting to look into bento boxes, too, Zole! I’d love to find some non-plastic food serving things for them, both for at home and on-the-go! omg I love and am SO going to do this. Thanks! Great idea- thanks for sharing! I have a bento style lunch box for my 5 y/o’s school lunches which I thoroughly recommend too. I’ve seen Muffin Tin Mondays (or some such day of the week) online and I’ve also seen Monkey Trays, which I think are cool, too. I love how one cup can hold a cup, too! I wonder, though, how often do you use these? I mean, do you whip out the trays occasionally or is it a once / day thing? It really depends! Some times we go weeks/months without doing it, but then get back into it and do it once a week or almost every day for awhile! We’ve been doing it a lot lately (3-5 days a week for lunch), and the girls still like them a lot – they haven’t lost their “novelty”, at least not much! What a great idea… why didn’t I think of that!? Not only does it make the meal fun, but many children don’t like it for their different foods to ‘touch.’ This solves that. I LOVE this idea! I will definitely be using it! What a fun way to get my picky little man to try new things!